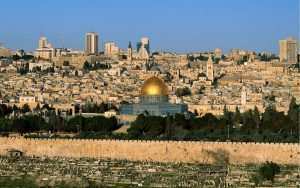 Jerusalem is undoubtedly one of the world’s most beautiful cities. As you explore the streets of both the new and old city you will come across countless stunning buildings, greenery and lovely views. However, often it is hard to get the best vantage point on street level and this is where the rooftops come into play. There are many accessible rooftops which offer stunning views and best of all, many of them are also home to cafes and restaurants. The most famous rooftop in the Old City is probably that of the Austrian Hospice. The Austrian Hospice opened in 1863 on the Via Dolorosa in the heart of the Old City. It was built in the style of Vienna’s Ringstrasse palaces and the building and its garden offer a tranquil rest from the noise of the city but the real treasure is the roof. After entering the Hospice you go through to an old elevator which will take you up a few floors. You then need to climb some stairs and will emerge onto the rooftop. From there you can enjoy a fantastic view of the Old City and its landmarks before heading downstairs for some apple strudel and a coffee. If you enjoy the view from the Austrian Hospice then you could go on the Old City Rooftop Walk. It is easy to get up on to the roofs from an entrance point on Rehov Chabad where it meets St Mark’s Street. You can then explore large amounts of the Old City and enjoy some truly unique views. If you are looking for a view of the Old City from modern Jerusalem then a great option is the Mamilla Hotel rooftop café. You don’t have to be a guest at the hotel to visit the café, you just go to the hotel lobby, take the elevator to the top floor and emerge to a truly beautiful view. Unfortunately it is quite an expensive place to eat but if you are just after a cup of coffee then it should be in most people’s budgets. Alternatively, near to the Mamilla Hotel is the Notre Dame of Jerusalem which is home to the ‘Rooftop Wine & Cheese Restaurant’. This is a stunning guest house built in the 19th century and it is owned by the Vatican. The rooftop restaurant offers an excellent selection of wine and cheese, but more importantly one of the best views to be had. Although it may not be the best place to stay for a meal, it is certainly worth a visit if just to see the view. More firmly in modern Jerusalem is Tali Friedman’s Atelier in the Mahane Yehuda market. Tali Friedman is a respected chef who will take you on a tour of the market and then run a cooking workshop in her studio. This in itself is loads of fun and you can then enjoy a meal on her rooftop and enjoy the sites and fantastic food. These are just a few ideas, there are many other hidden rooftops and terraces to be discovered all of which offer great views of the capital city.